Are you looking for reliable, affordable swing set removal Carmel Indiana area residents can trust? Look no further than the junk removal professionals at Fire Dawgs! We are a local, firefighter founded and veteran owned junk hauling company. Additionally, all of our technicians are trained, insured, drug tested, and background checked. Our team will always arrive to your junk removal appointment in uniform in a Fire Dawgs truck. Keep reading to learn more about our Carmel swing set removal service. Fire Dawgs Junk Removal is the most trusted junk removal company in the Indianapolis area, and we know our Carmel customers. Furthermore, we know that Carmel residents take amazing care of their homes and property. Also, we know that you want professional service. That is just what we have to offer! We aim to live up to our motto at every service. We even call you 2 days after your junk removal service to make sure that you’re happy with the job our team did. Are you ready to experience exceptional customer service? Give us a call or Contact Us online to get started. First, give us a call at 317-291-3294 or Contact Us online. Also, there’s even a text option on our Contact page! Next, we will get you some pricing information. We’ll also set you up with a free, no obligation estimate. Next, you accept or decline the estimate we provide. We hope you accept! We schedule a time that works best for you. Our team will have your swing set removed and hauled away in no time! We shake hands and make sure the work completed is AWESOME. Finally, we’ll call you to check to make sure the service you received from our team was great! 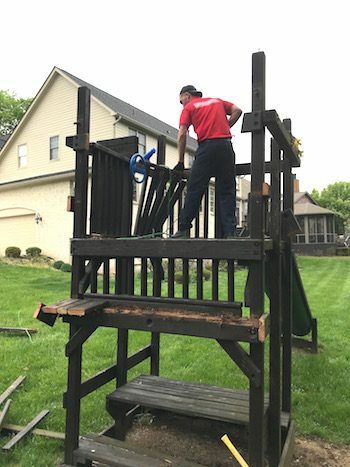 We hope you’ll call Fire Dawgs for swing set removal Carmel residents can trust. Let us know if you have any questions. We hope we have the opportunity to serve you! Previous Previous post: Are Fire Dawgs Employees Drug Tested? Next Next post: How Much Does it Cost to Haul Away Junk in Indianapolis?